Got some house painting to do this summer? So does Bates. And where better to begin than at the beginning, with the college’s oldest building, Hathorn Hall (1857). Bare wood. Southern yellow pine, to be specific. Enter Giles Giguere of Higgins Custom Painting in Lewiston, who will apply coats of Peel Away 1, a paint remover that’s corrosive while wet, but environmentally friendly when dry. He’ll cover each treated section with a special laminate paper for 24 hours, “so it gets good and saturated,” says Giguere. When the paper is lifted, off comes the paint. Well, some of it comes off. He’ll repeat the process three times on each section, then wash the bare columns with water and treat the wood with Citri-Lize, a neutralizing agent. After the columns get a good sanding, the Higgins team will apply at least one coat of oil-based primer followed by two coats of semi-gloss acrylic exterior finish paint to match Lane Hall’s columns, which received the same treatment in 2011. 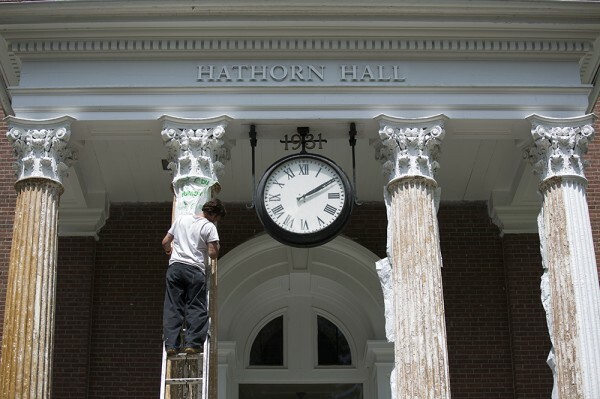 Weather permitting, stripping and painting Hathorn’s columns and doing trim work around the east and west entrances will take six to eight weeks. “The way Bates is, you want everything looking good,” Sands says.